In our Day to Day life and in industries in general we come across many surface where painting has been a problem due to weather conditions, surface and surrounding conditions etc. One of the main problem is that of HEAT. Whenever the surface is in contact with high temperature the normal enamel paint will CRACK & PEEL OFF. Due to this the surface will come to CORROSION of various nature. Every year millions of rupees worth of Plant and Machinery is destroyed Due to Corrosions of this nature. To counter this effect STAR PAINT & OIL PAINT called HEATEX which confirms to international standard and has been vigorously tested by various Government and Private Laboratories. HEATEX Aluminum Paint has unique features equaled by only a few well known brands throughout the world. It has advantage of superior quality and un-equaled performance. Though it is supplied in 'Ready Mixed Form', it does not turn Black. Different grades of heat resisting aluminum or black paints are manufactured for service in the range of 200*C, 400*C and 600*C Red primer and Grey paint Heat Resisting upto 300*C are also available. Drying Time 4 to 8 hours. Standard Packing 1 & 4 litres containers. Select correct temperature of Heat Resisting Paint. Surface temperature at the time of application should be room temperature. Clean the surface to be coated thoroughly by sand blasting or wire brushing or by emery paper or sand paper. Surface should be dry, free from dirt, paint ,rust, oil grease etc. 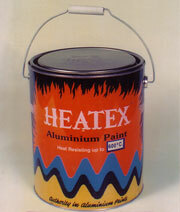 Heatex paints should be applied over clean bare Surface. No primer should be applied to the surface. No solvents, thinners or turpentine should be added. The Paint can be sprayed or applied by new clean brush. The Paint is air-drying as well as stoving. A. Air-Drying : Apply 2 coats of paint at the interval of 4 hours. B. Stoving : Apply Paint by spraying & bake at 160*C for 20 to 30 minutes. After use keep the tin airtight closed.